Don’t make the terrible mistake of hiring the wrong home remodeling contractor. You’ll suffer cost overruns, schedule slips and emotional hardship if you do. My home remodeling contractor screening guides, or “bid sheets”, are the perfect tools for making sure you hire the right contractor for your home remodeling project. I have contractor hiring guides / bid sheets for all major home construction and remodeling projects including new home construction, room additions, bathroom and kitchen remodels, basement remodels, garage additions, etc. The single most important thing you need to do when kicking off a major home remodeling project is hire the right home remodeling contractor. 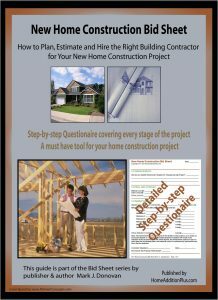 My home remodeling contractor screening guides / bid sheets help in this process by providing a multi-page detailed questionnaire that you provide to prospective contractors to fill out. The contractor screening guide is just part of the overall “bid sheet” product. In addition to the contractor screening questionnaire, the bid sheet also contains extensive homeowner information and advice about the particular home construction project. This key information allows the homeowner to intelligently review and assess the home remodeling contractor screening questionnaire responses. Moreover, each home remodeling bid sheet also includes cost and schedule estimate examples for the particular type of home construction project. Lastly, for the larger home remodeling and construction projects, a separate cost breakout Excel spreadsheet is provided that allows the homeowner to estimate and keep track of their home remodeling costs during the construction. Conducting a thorough home remodeling contractor screening is critical because unfortunately there are just so many bad contractors out there. So many of them simply either lack the skills to do a quality job, or they are ethically challenged. The bottom line, either one of these two negative traits will cost you dearly. I’ve personally experienced some of these situations in my early years hiring home remodeling contractors. If they weren’t demanding ridiculous upfront deposits, they were showing up to the jobsite late, slipping schedules and cost estimates, and doing shoddy work. As I got a little wiser, I began to do my homework on every contractor I hired. For example, I started making sure they had a contractor’s license, were properly insured, and had no complaints against them with the better business bureau. I also made sure to do several reference checks on them prior to hiring them. With these few simple screening techniques I was able to hire much higher caliber contractors that were truly professionals and decent people to work with. 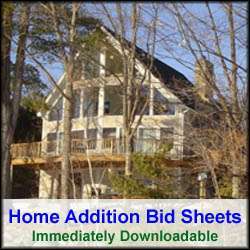 So prior to kicking off your home remodeling project, make sure to get one of my home remodeling contractor screening guides / bid sheets. Like thousands of other homeowners who have purchased them, you’ll be thanking yourself for doing so.